One team member was tracking time for the wrong project, as a manager, is there a way to edit time entries and assign them to the correct project? 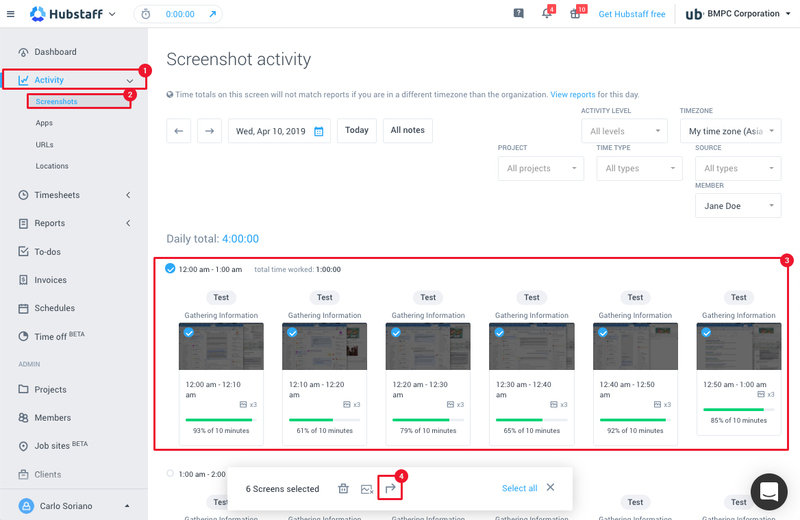 Yes, you can do this by navigating to Timesheets -> Daily on the left sidebar. Make sure that you are selecting the right user in the filter located in the upper right portion of the page. Then, press the actions button right next to the time span that you want to edit and select “Edit time entry”. Select the project/task that you want to transfer the data to. If the time was tracked automatically (using the time tracking application), all the data will be allocated towards the new project. This includes: screenshots, activity level, URLs visited etc. Make sure you are providing the reason why you are editing the specified time entry. 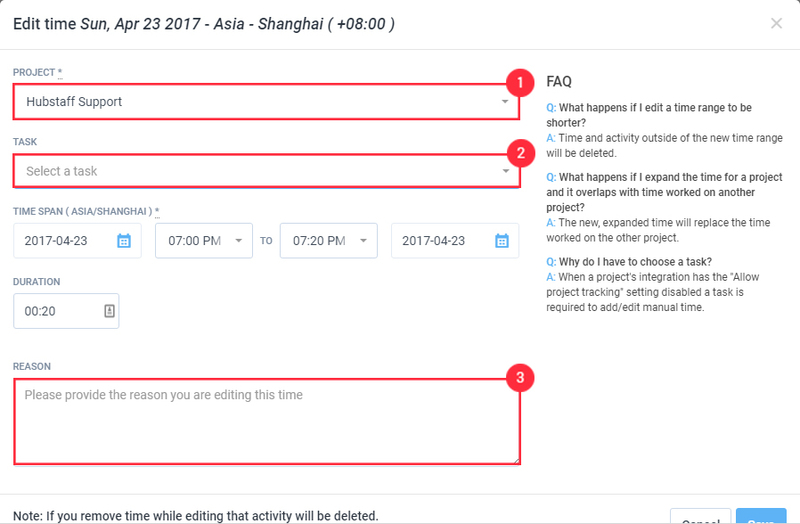 Press the project/task of the time entry and you’ll get prompted with a modal that allows you to select the project/task to transfer the tracked data. In the modal, you can select the project/task where you want to transfer the data to by using the search box or manually search for the project/task in the list. You can also move/transfer activities from a project to another through the activities tab. Go to activities and select the activity blocks you want to move/transfer to another project. Then click on the arrow icon to choose where to move the data. A dialog will display the amount of time being selected. Select the correct project/task and provide the manual edit reason if required. Then click save. If you remove time while editing that activity will be deleted. 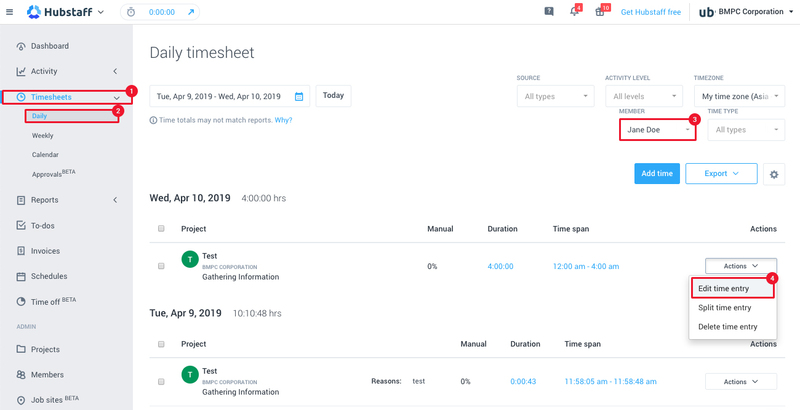 When you edit a time span to make it smaller you are removing activity and time for that time span regardless of if you assign a portion of that time span to a different project. In that case you are just making the time span smaller and assigning that time to a different project. If you ‘move’ time to a different day all associated data is erased (notes, app + url, screenshots, locations) as you are removing the old time and creating new time at the destination. You cannot split a single time span between two projects. It’s either one or the other. If you want to keep all the time intact, then you needed to either change the project without editing the time or edit the time then add the remaining time to the other project manually. Accounts with a “user” role can also edit their own time entries if the “modify time” setting is enabled in the organization or for that particular user.